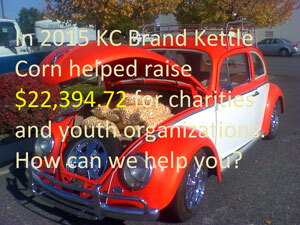 KC Brand Kettle Corn has been in business since March of 2004. Since that time, we have done hundreds of fundraisers and helped raise tens of thousands for local charities. How we do this is through two different types of fundraisers. The first is a is a Catalog Fundraiser. This works well with either groups or individuals. For this fundraiser, you just need to let us know that you are interested in doing it and we will email you a sales sheet. Using this sheet your group can sell all of our kettle corn flavors to friends, family, and neighbors. After your group has sold as many as it can, email us the form and we will make your order for you and deliver it to the pre-agreed upon location. One benefit of this fundraiser is that it can’t be cancelled due to weather. Which makes it great for seasons burdened by rain, wind, and snow. This is also a good one to do in July and August. There is currently no charge for delivering within the Tri-Cities. For orders outside of the Tri-Cities, delivery fee will be determined by order size and distance. The cost to your group is per bag. There are no upfront fees for rental. How it works is…you schedule a time with me and make sure you schedule the same time with your choice location. I like the Albertsons on Clearwater or Maybe a Wal-Mart. You may consider working in shifts. So, if you are selling between the hours of 9:30 and 4:30 set half the kids and parents for the first shift and the other half for the second shift. But, you want as many people as possible some for bagging kettle corn and many for selling. The more people you have the more chances you have to be successful. This works best with 12 or more people at all times working and selling. The cost is $350 plus cost of goods sold (COGS). So, $350 is the upfront cost then your COGS is your variable cost. Example if you sell $1500 worth of popcorn your cost will be about $594 ($350+$244 in COGS) Total profit $906. This is a rough estimate because the COGS vary slightly with every group. The nice thing is that we pop the corn and set up the tents and clean up the mess. Your group just needs to bag the kettle corn and sell. 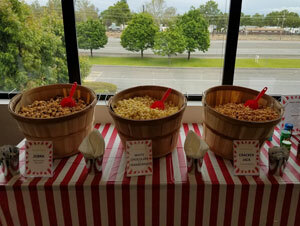 Why Choose Kettle Corn For Your Next Fundraising Event? Whether you want the proceeds from the sale of our kettle corn to go to a worthy cause or you’re hoping to raise money for a student trip, we can help. 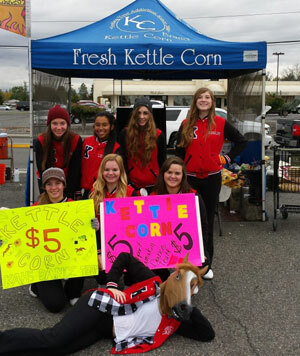 Our Tri-Cities, WA customers know that they will always have fun with their next fundraising effort when they work with our kettle corn pros. 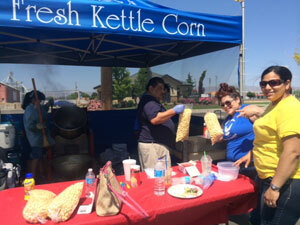 And because our kettle corn is offered affordable prices you will make a significant impact on your fundraising goals. We love working with local businesses, schools, churches, and neighborhoods to create a fun, sweet way to raise money. It’s a win-win: people get to satisfy their sweet tooth and you get to raise money! All you have to do is book our kettle corn stand and we’ll do the rest. If you want to get results on your fundraising needs quickly, kettle corn catalog fundraising is the way to go. We love supporting great causes and local programs, so just reach out the next time you’re thinking about catalog fundraising in the area. 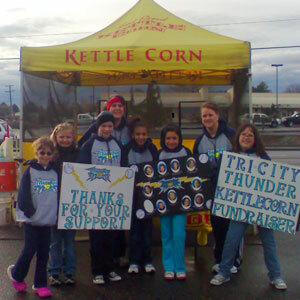 Book our KC Brand Kettle Corn stand for your next fundraising event or call us for customized kettle corn catalog fundraising in the Tri-Cities area at 509-947-3262. All bags are $5. Presales are: the sales you make to family and friends prior to the day of the fundraiser. These orders are filled during the fundraiser and therefore the cost of goods is affected in the same way as every other bag sold that day. Presales are a good way to ensure profit at the fundraiser. If you make $350 in presales, you can cover the rental fee before you even show up and then you only need to worry about the COGS. We highly recommend it. The $350 cost of rental applies to the Tri-Cities. There is an added fuel charge for any fundraisers outside of the local area. Due to the fact that there is only so much that can be popped and bagged in one-day presales are limited to 200 bags, more than that will require special considerations to work it, which could add on at an extra expense. Weather plays a major roll in the success of on-location events. Certain weather, due to safety reasons, cannot be worked in at all. At any time, our staff can cancel a fundraiser, if we feel that there is a safety issue. Jeramy Schultz, KC Brand Kettle Corn, and/or any employee/agent of the company cannot in any way guarantee sales or success. We (Jeramy Schultz, KC Brand Kettle Corn or agent thereof) do not recommend any particular sales method and are not responsible for your safety in regard to how you and your group sell our product. If you have any questions, feel free to call me at 947-3262, at my email jeramy61@msn.com, or through the contact form at kcbrandkettlecorn.net.